Brazil's President is a Friend to President Trump and Biblical Values: "We are God-Fearing Men"
"It is time to overcome old resistances and explore the very best potential between Brazil and the United States. 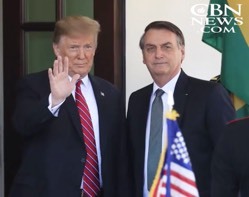 After all, it is fair to say that today, Brazil does have a president who is not anti-American," Bolsonaro said during a press conference in the Rose Garden Tuesday. During a two-hour meeting at the White House, the two leaders signed agreements and discussed how to work together to end the upheaval in Venezuela. "I want to congratulate you again on your tremendous election victory last October. It was an incredible feat and really a truly incredible challenge and the end result was something the whole world was talking about," Trump said. "My campaign didn't have a lot of money; almost all the media in Brazil were against us, so it was a huge miracle that we won," said Bolsonaro. "To a large extent, I support what Trump does; He wants to make America great, I also want to make Brazil great. I also have concerns about the indiscriminate entrance of foreigners without any criteria. But beyond this, we are both Christians and we are God-fearing men," he explained. Bolsonaro's middle name is "Messias," Portuguese for "Messiah." He's a Catholic and his wife, Michelle, is a Protestant evangelical who attends a Baptist church. "Doctors who attended to me said that for every 100 stabbings of the kind I endured, only one person survives. So, I am a survivor and owe my life to God. It was His will for me to live." 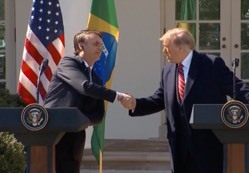 Both Bolsonaro and Trump refused to say whether military plans were on the table to intervene in Venezuela. "I discussed this matter with Trump and obviously that conversation will remain private. Trump says all possibilities are on the table, and I in large support decisions of the American government." "Even though Bolsonaro is not an evangelical, he always defends the principles that we evangelicals have defended namely: he is against abortion, he is against the privileges of the LGBTQ movement, he recognizes the greatness and importance of Israel, defends the family and wants to fight corruption and restore our economy," said Malafaia. "The ideology of the left has taken over the universities and also the journalists of Brazil. The impact has been the worst possible, and one of the main goals is to erode family values," said Bolsonaro. Bolsonaro's motto is "Brazil above everything, God above all." He believes it is a powerful statement about the importance of truth in politics. "I have been a congressman for 28 years and I saw that in politics the truth almost never existed, and my feeling is that our people are thirsty to know the truth," he explained. "Just like in a marriage between a man and a woman, if you don't have truth, the marriage ends quickly. In politics, if you don't have truth the government ends quickly," said Bolsonaro.